KINGSTON, JAMAICA—7 August 2017. Fly Jamaica Airways on Monday sincerely apologised to all passengers affected by the irregular operations beginning August 3, 2017. Fly Jamaica Airways says it expects to be back on schedule by Thursday August 10, 2017. While these delays to the airline’s services are regrettable the airline remains committed to making safety its first priority. 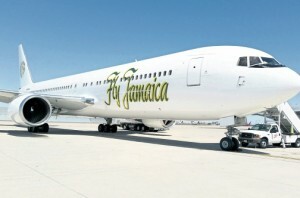 The Jamaica-headquartered carrier, whose top executives include Guyanese, explained that Fly Jamaica Airways grounded its Boeing 767 on Thursday, August 3rd prior to departure from Norman Manley International Airport in Kingston. After safely returning to the gate, passengers were fed onboard before being transferred to the airline’s Boeing 757 aircraft. Thursday’s circumstances have been compounded by external factors at the ports Fly Jamaica Airways operates in and out of daily. “An ongoing strike by ground staff of Swissport Canada Handling Inc.— Fly Jamaica Airways’ contracted handling company at Pearson International Airport in Toronto— continues to adversely affect the operations of all airlines they service and have resulted in ramp congestion and significant delays in the offloading of baggage and deplaning of passengers upon arrival at Pearson. At the JFK International Airport in New York, prolonged baggage screenings and checks being conducted by the U.S. Customs & Border Protection on all flights out of Jamaica and Guyana, have added several hours onto the turn around times, causing additional delays,” the airline said in a statement. Fly Jamaica said disruptions to the airline’s scheduled service to and from Toronto are expected to continue to some degree as long as Swissport Canada Handling Inc. continues to strike at Pearson International. Fly Jamaica Airways says its reservations staff is working around the clock to ensure all passengers are contacted via telephone with revised flight information. For updated flight schedule information please visit www.fly-jamaica.com and click on the “Customer Advisory: Updated Flight Schedule” banner at the top of the page. All flight schedule updates will be published to this page. Updates to flight times are constantly being made based on actual operation times and are subject to change after customers have been advised or updates have been published online.